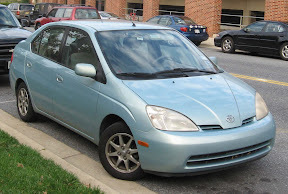 Hybrid cars, like the Toyota Prius, do not really save all that much money. Image from Wikimedia Commons. Part of marketing campaigns for hybrid cars is that they save money on gas. It would appear so, since the typical hybrid car uses less gasoline than a standard automobile with an internal combustion engine. However, a study has just been released which rakes hybrid cars over the coals for wasting a lot of money. A new study has been released which calls the cost effectiveness of hybrid cars into question. The study, according to USA Today, was prepared by the website CarGurus.com, and it analyzes several generations of hybrid cars from 2003 to 2010. The study found that many hybrid cars and hybrid SUVs had too high a sticker price, or too high an increase in sticker price over traditional models, for any savings from gas mileage to make up the difference in price. The average difference in sticker price between hybrids and regular models was 17 percent. In order for the savings to pay for the higher sticker price, or opportunity cost, gas prices would effectively have to rise to $7 per gallon. To calculate if a hybrid pays for itself, look at the difference in sticker price. For example, compare the base Honda Civic Hybrid Sedan versus the base Honda Civic. The price difference is $8,145. Then look at the combined gas mileage for both. Combined mileage figures are available from the Environmental Protection Agency at fueleconomy.gov. Bear in mind, these figures are entirely based on estimates. EPA (estimated) combined mileage of Civic Sedan: 29 miles per gallon. Then, calculate the amount of gas that would be consumed per year. To do that, divide the average number of miles a person drives, conventionally assumed to be around 15,000 miles per year, by the combined mileage of each vehicle. Civic Hybrid Sedan: 15,000 miles/41 mpg = 365.85 gallons. Civic Sedan: 15,000 miles/29 mpg = 517.24 gallons. Next, multiply those by the average cost of gasoline, which was $3.54 as of March 11, 2011, according to the Automobile Association of America, or AAA, to determine yearly fuel costs, assuming gas prices stay constant. Gas savings = $535.93 per year. To see how long until the opportunity cost of the hybrid is recouped, divide the price difference by annual savings. Savings = $8,145 / $535.93 per year = 15.2 years to recoup the initial cost difference. To recoup the initial cost of this hybrid, the owner must keep the car a significant amount of time and/or gas prices must rise significantly. Not all hybrids lose money; this is purely an exercise in speculation and does not include cost of repair and upkeep, nor any other savings such as on insurance. Other models of hybrid may save money. However, some have too high a buy-in cost to do so, and if buying one puts you in a position of taking out loans to make it to payday, the most economic decision is to look elsewhere for savings.